George, seeing as my wife and i's children practically make us read them their autographed copy of the Ice Dragon every night which we can pretty much recite at this point I've decided you should do an audio version of it where they turn the pages and hear your voice reading to them! Their grandmother bought them a children's book where she could record her voice into it reading to them! I think it would be a brilliant idea! Instead of grandparents or parents reading to them it could be you! Good day George, our family of 6 loves you and your work. Will there ever be a ASOIAF song album? I mean, with bands playing the songs, like they did in the show with "The Bear and The Maiden Fair"? I'd really like to see a real band playing "My Featherbed"
Hello Sir. Your last The Winds of Winter post is already frozen and i can't leave a comment, so i will leave it here, i hope its ok.
First of all, excuse-me for my English, it is not my native language so i will keep it short. I just wanted to say that you are bigger than what they are making of your work. You are bigger than the TV show, you are bigger than HBO, you will be forever remembered as one of the greatest writers of all time. That said, just take your time and finish the books at your own pace, knowing that your true admirers understand the complexity involved in a work of art such as your creations. I really don't know how to express much of what i think about you, and i written this small message with the help of a translator and the little that i know about English. But at least i made you aware of one more fan or your work in the World. Very excited for this! I love listening to audiobooks. Hi George, I was wondering, you see the tremendous success that super hero adaptations have nowadays, so this is the perfect momente, I think to produce a movie or a Tv Show about Wild Cards, it would be very successful for sure, Wild Cards is amazing, it have a terrific and original storyline and very carismatic characters. I know that you said a few years ago that you guys were with a movie in the plans, but I wonder why it didn't came out yet? Like I said, perfect time for wild cards be presented to a bigger audience. I'm excited about this project. Sounds like an ideal venue for experiencing the Wild Cards. What's the best way to contact you regarding reprints of your short fiction in audio? Any chance for this collaboration?!? Any chance that all of the authors on both side of puppgate(minus Vox of course) involved in a new Wild Card Book?!? How awesome would it be to have so many authors with so many different views under one banner. Oh well a guy can dream right!! Re: Any chance for this collaboration?!? There's a considerable variety in political views amongst the current members of the Wild Cards consortium. Talent -- the ability to tell a great story -- has always been my chief criterion for recruiting Wild Cards writers. Though not the only one. A shared world is a peculiar beast with its own peculiar requirements. One of the most important is an ability to play well with others. This is very much a team project. 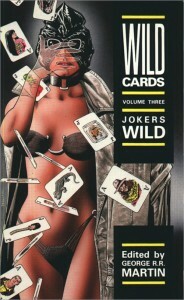 Great to hear that we will have an audiobook recording of Jokers Wild. I've listened to the first two volumes narrated by Luke Daniels (my first contact with the Wild Card universe) and have enjoyed them immensely. Personally, I don't mind audiobooks, even ones with a complex narrative structure and different viewpoint characters, being read by the same narrator. Going with different narrators burdens the production team with the task of keeping track of continuity regarding pronounciation, speech patterns, mannerisms etc. Some audio productions I've been listening to in the past have not done this without fault. When for example names of characters are pronounced one way by one narrator and differently by another, that might make the listener stumble and even take him out of the story.